Mark, the owner of Neptune Bakery, contacted us at the beginning of the week needing help with his logo. He had a sign at his business with his logo on it but he wanted a few changes to it and also needed it in a digital / computer format for printing. He sent us a picture of the sign and his requested changes he wanted done. After about a week, our logo designer presented a few mock-up designs for him to choose from. The same day, the final modifications were completed and the logo was approved. We appreciate the business from Mark and Neptune Bakery! Steve contacted us last Saturday needing some help to create a website for his farm. He specializes in raising Kiko Goats and his farm is called Cedar Bluff Ranch Kiko Farms in Northwest Louisiana. He was ready to get started right away during our phone call so we moved forward very quickly. Steve sent us information to put on the website by Monday morning. On Monday, we had the majority of the website setup and ready. Over the course of the week, he sent a few extra pictures, information about him and the farm, and we finalized the design on Thursday night. The website is now launched and live! The website for Cedar Bluff Ranch Kiko Farms is at cedarbluffranchfarms.com. Tracey reached out to us several weeks ago asking to create a new website for her printing business – Choice Graphix. She had a website a while ago but let it expire. However, she was ready to have a website created for her and get back into business! Tracey wanted us to create a basic eCommerce site to allow her to login and add all of the products herself. We setup the site and the categories and created a contact page which includes a basic contact form. The website is also mobile friendly and has social networking integration. Tracey is ready to take over and start adding items to her website and begin making custom printable items for customers! The website for Choice Graphix is at mychoicegraphix.com. Charles, the owner of Dynasty Homes of Greenville NC, contacted us a few weeks ago. He was wanting to have his website updated with the ability for them to manage it going forward. We proposed a quote to Charles to re-design the website and add all of the manufactured homes they already had on the website. Once he received the quote, he was ready to go and got us started right away. He also chose to have us host the website and manage his domain name. His current provider’s cost was more than our rates and he wanted to have one contact for all of his website needs. Today, we spoke with Charles over the phone to complete some of the final requested changes and the site is now live! We appreciate the business from Charles and look forward to a great business relationship. 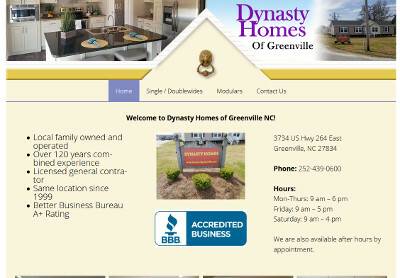 The website for Dynasty Homes of Greenville NC is at dynastyofgreenville.com.